Much of the focus on Podemos so far has been on its remarkable electoral outcomes and promising ability to mobilize hundreds of thousands of people, whether online or in the street. Online, the party has attracted over 370,000 members, who debate and vote on programme, policy and strategy via open-source platforms such as Loomio and mainstream social media such as Reddit. In the streets, Podemos called for a marcha del cambio (‘march for change’) on 31 January 2015, which conservative estimates claim attracted over 100,000 supporters to Madrid’s Puerta del Sol. The year that spanned from the European elections on 25 May 2014 to Spain’s municipal and regional elections on 24 May 2015 have witnessed the party become the third strongest across much of the country. Its five representatives to the European Parliament, which a year ago seemed unprecedented, today appear underwhelming by comparison. At a municipal level, Podemos led joint candidacies – with parties such as Equo, Spain’s major Green party, and citizen platforms such as Ganemos and Guanyem Barcelona – that won mayoral elections in the country’s biggest cities, Madrid and Barcelona. These joint candidacies propelled Manuela Carmena to overcome a quarter-century of conservative rule in Madrid and Ada Colau to reveal further conservative privatization under the guise of nationalist solidarity in Barcelona, turning the city’s attention instead to questions of evictions and cancelling corporate tax breaks. But electoral outcomes and mass mobilization alone cannot explain the rise of Podemos. These also cannot explain, as Pablo Iglesias points out in a recent article for New Left review, ‘the unceasing offensive against Podemos, conducted with a virulence unprecedented for Spain, [which] reveals the extent to which we are seen as a real threat to the dynastic parties’ system’. Though a significant part of this article will embark on the challenge of explaining the nature of this offensive against Podemos, I first want to explore some of the ideas its leaders harbour that the establishment parties find so threatening to their grip on power. Unlike mainstream political parties in Spain, where the party machinery usually dictates that its higher-ups hold some kind of perfunctory graduate degree, many of the most high-profile members of Podemos are working academics – political scientists, physicists, economists, historians and philosophers. Some of them, including Iglesias and Íñigo Errejón, have been confined – like so many of their professional counterparts all over the world – to underpaid, precarious adjunct positions. Iglesias, Errejón, the recently departed Juan Carlos Monedero, and other visible leaders specifically practised their trade as political theorists in the Department of Political Science at the Complutense University of Madrid, Spain’s largest and most prestigious public university. If there is a political theory that underlies ‘the Podemos hypothesis’, as Iglesias calls it,  it has two distinct components. One of these has to do with Laclau and Chantal Mouffe’s neo-Gramscian revision of the concept of hegemony and the former’s theory of populism. The other component is their wager on the importance of televisual and social media as the instrument for developing this hegemony, or what I will call their ‘neo-Leninist communication theory’. Errejón, the primary Laclauian theorist in Podemos, defines hegemony in the following way: ‘the capacity of a group to present its particular agenda as incarnating the general interest (a particular that builds a universal around itself), a contingent relation that is always incomplete, contested and temporary.’  In addition to this basic definition of hegemony, Errejón, following Laclau, sees ‘floating signifiers’ as fundamental to articulating the group’s incarnation of the general interest. For Podemos, these floating signifiers so far have been less terms like ‘democracy’ – Laclau’s preferred floating signifier – than ones like la casta, el pueblo and el régimen del ’78 (‘the establishment’, ‘the people’ and ‘the regime of ’78’, the latter referring to the year of the Moncloa Pact, an agreement among political parties and trade unions over how to run the country’s economy, which largely left untouched the people and companies that had profited from Franco’s liberalization of the economy since 1959). Contrasting with more conventional readings of Laclau and Mouffe, Errejón places more emphasis on the universalizing aspect of constructing a radically democratic ‘hegemonic bloc’ than on the complex way in which the construction occurs. He notes that hegemony is ‘not only a question of leadership nor a mere alliance of forces, but rather the construction of a new meaning that is more than the sum of its parts’. Beyond this, however, he does not explain how this construction is supposed to occur in his account of Laclau and Mouffe. Other Laclau and Mouffe scholars such as Anna Marie Smith have attempted to explain this at times vague aspect of their work. Unlike the construction of a coalition party, for example, Smith understands this process ‘to take the form instead of continuous negotiations that give rise to new hybrid identities and temporary blocs. In so far as these negotiations were successful, democratic values would take hold within movements, circulate among different movements and radiate out into new areas of the social.’  This process, Smith notes, would reproduce itself, thereby further internally democratizing these different movements – which include everything from the workers’ movement to LGBT rights. Laclau and Mouffe’s understanding of hegemony, according to Smith, would thus retain the most egalitarian aspects of both liberal theories of pluralism and of Marxism, rejecting the economic capitulation to capitalist markets of the former as well as the class-centred political analysis of the latter. Errejón’s reading of Laclau and Mouffe agrees with some of Smith’s explanation as to how hegemony might be constructed. But it ultimately departs from Smith’s and other prevailing readings on two points. Errejón’s reading directly confronts the idea that the construction of a hegemonic bloc is a bottom-up process, and it reflects the wariness of many on the Left of ‘the dangers of charismatic and vanguardist leaderships’. In his Le Monde diplomatique essay ‘What is Podemos?’, Errejón explains the ways in which Podemos has challenged the ‘taboos of the classical Left’. Though he is ostensibly talking about Podemos, it nonetheless seems clear in the essay that Errejón is at the same time offering his own reading of Laclau. He writes that Podemos has addressed three presumptions that have limited older socialist projects: ‘the rigidity of the mechanism of the social’, ‘the taboo of leadership’ and inherited definitions of political signifiers. The first of these presumptions refers to the idea that political actors must build social movements first and only then seek to translate these into electoral victories. Podemos, on Errejón’s account, is instead a reading of the 15-M movement, ‘an initiative that was born from above, and, against the fatalistic idea of many activists that “there are no shortcuts” and the extreme Left, it defended the idea that the electoral arena was also a moment of the articulation and construction of political identities.’  The second point concerns the anti-democratic tendency critics see as a risk inherent in any attempt to build a political party around the appeal of a charismatic leader. According to Errejón, Podemos, by contrast, has shown that the strategic use of leadership in the case of Pablo Iglesias does not merely complement, but is in fact a fundamental component of building hegemony. The third and final taboo Podemos challenges, on Errejón’s account, involves the sacrosanct and assumed division between Left and Right. In a country where the Socialist Party (PSOE) survives by self-identifying as a left-of-centre party but promotes many traditionally right-wing policies when in power, such assumed divisions lose all meaning they may have once had. Moreover, much of Spain’s rural and working-class population does not identify with the Left. Dichotomizing discourse that opposes ‘democracy’ to ‘oligarchy’ or ‘citizenry’ to ‘the caste’, Errejón argues, redefines ‘the sides (the identities), the terms, and the battleground itself’. These new dichotomies, he writes, ‘aspire … to isolate the elites and generate a new identification against them’. Though this last taboo isn’t necessarily one held by Smith and other scholars, Errejón’s challenge to it discloses his sympathy for the Laclau of On populist reason over the Laclau and Mouffe of Hegemony and Socialist Strategy. The final component of Podemos’s political theory is what I will call their neo-Leninist recognition of the importance of communication to constructing hegemony. In his often-ignored chapter on an allRussia political newspaper in What Is to Be Done?, Lenin makes the argument that, while political movements are built by organizing people in the street, ‘there is no other way of training strong political organisations except through the medium of an all-Russia newspaper.’  Lenin was aware of both the geographical and the ideological reach a newspaper might have in tsarist Russia. He even went as far as claiming that ‘The publication of an All-Russian political newspaper must be the main line by which we may unswervingly develop, deepen, and expand the organisation (viz., the revolutionary organisation that is ever ready to support every protest and every outbreak).’  While this is perhaps the most forceful expression of his assertion, it nevertheless illustrates Lenin’s claim about the constitutive role of media in developing support across a range of classes. Although Iglesias and Errejón do not cite any theoretical influences in the party’s media-first political strategy, Podemos in many ways has radicalized this Leninist approach, using Spain’s tertulias – political debate shows – as the primary way of gathering support and developing a hegemonic bloc. In Spain, Iglesias writes, ‘people no longer engage politically through parties, … but through the media’, and, thus, local television programmes such as La Tuerka and Fort Apache ‘were the “parties” through which we would wage our political struggle on the most fundamental terrain of ideological production: television’. Nationally broadcast political programmes have turned into a kind of parliament, Iglesias notes. Many stations were forced by the demands of ratings to include at least one slot for ‘victims’ of the economic crisis. Television, Iglesias writes, ‘conditions and even helps manufacture the frameworks through which people think – the mental structures and their associated values – at a much higher level of intensity than the traditional sites of ideological production: family, school, religion’. Social media, by contrast, still do not have the same uniform appeal in Spain as television. This media-first approach, which sets Podemos apart from any other party in Spain, as well as from earlier leftist attempts to build a populist platform, is in large part the method through which the organization expanded its electoral support beyond 15-M movement participants and small leftist groups across the country. For this same reason, however, Podemos has also been the most heavily criticized party in Spain. Whether on television or in the pages of newspapers and books, the party has endured sustained attacks from both the Left and the Right. These criticisms, I think, reveal latent anxieties, especially on the Right, about the future of their own political commitments and how best to pursue them electorally, as well as how best to defend them on the intellectual battlefield of opinions and ideas. The Spanish Right is a strange beast. Today it is largely unified politically under the banner of the Popular Party (PP), though it is increasingly losing votes to Ciudadanos (Cs), a centre-right anti-nationalist Catalan party. Yet its ideological and political unification hinges on a strange balancing act that combines National Catholicism and economic liberalism. The first of these was the official state ideology under Franco and, to this day, still persists, although often in muted form, in the thought of PP ideologues. The second, also a relic from the Franco era, became increasingly more common on the Spanish Right after the first steps to liberalize Spain’s economy were taken circa 1959. Owing to these historical reasons, economic liberalism and the term ‘liberal’ itself, unlike in its European neighbours such as Britain, France and Germany, are almost exclusively the domain of the Right in Spain. Falangists and the right-wing ‘reformers’ within Franco’s party brought economic liberalism to Spain in the 1960s. Manuel Fraga Iribarne, Franco’s outspoken minister of tourism and information, spearheaded the regime’s gradual adoption of liberalism. A great admirer of Carl Schmitt, Fraga, the eventual founder of the PP, at first despised neoliberal economists such as Friedrich Hayek, Ludwig von Mises, and Wilhelm Röpke for their anti-statism; after the transition to democracy, however, his desire to make a mainstream right-wing party compelled him to adopt economic liberalism, leading to the creation of the PP. Fraga embodied this Francoist tension between newfangled liberalism and National Catholicism that can still be found everywhere on the Spanish Right today.‘If conservatism is a specific reaction to a specific movement of emancipation,’ writes Corey Robin in The reactionary Mind, ‘it stands to reason that each reaction will bear the traces of the movement it opposes.’  Such is indeed the case with the rise of Podemos and its detractors. Since late May 2014, when Podemos erupted onto the international political scene with the election of five members to the European Parliament, conservative, but not only conservative, commenters have been keen to discuss, report and publish on the new leftist party in Spain. And many of those commenters, when asked what precipitated Podemos’s stunning rise, point to its media presence, especially Pablo Iglesias’s, as the answer. As the back flap of Asís Timermans’ book podemos? reads by way of explanation: ‘Podemos is the most mediatized [mediático] political phenomenon in Spain in recent years.’  But if Podemos’s media presence, in the eyes of these critics, is responsible for its swelling of support, it is no less true that these critics’ own method of undermining the party borrows significantly from it. During the intervening year that marked Podemos’s first and second elections, books critical of the party were published at a vertiginous pace. No less than thirteen books were published specifically on the party during that timespan, seven of which were critical. They appeared in a context already shaped by endless critical coverage in rightwing newspapers such as ABC, El Mundo and La razón and seemingly infinite amounts of time on channels such as Telemadrid, Intereconomía and the government-controlled national station Televisión Española (TVE) – all dedicated to undermining the party. In Spain, a country whose media are largely dominated by right-wing voices, this criticism often reveals as much about the shape and stability of the conservative movement (or lack thereof) as it does about its object of scorn. With this in mind, the remainder of this article will survey the conservative reaction in Spain to the emergence of Podemos, a party that, like Syriza in Greece, may have the opportunity to govern. Many have even claimed that it has already fundamentally redrawn the coordinates of Spanish politics. Robin’s book attempts to understand what motivates the conservative movement in the anglophone context by studying the history of its reaction to progressive struggles, from abolitionism to feminism. Conservatives, he notes, react most coherently, swiftly and unanimously to those emancipatory movements that present the greatest threat to their grip on power. It must present the danger, Robin writes, not of ideological defeat, ‘but [of] failure in the simultaneously threatening and galvanizing sense. Loss – real social loss, of power and position, privilege and prestige’, he continues, ‘is the mustard seed of conservative innovation.’  The next years and decades will judge to what extent Podemos will have been able to live up to the enormous hope many on the Left have invested in it. It will also unveil the degree to which the party truly threatened the conservative stranglehold on power in a country still recovering from four decades of fascist rule. By surveying the Right’s reaction to Podemos, I hope to explain and understand exactly what it is about the party – and, by extension, the inspirational force behind it, the 2011 indignados protests – that conservatives in Spain find so threatening to the ruling class’s loosening grip on power. This laundry list of grievances and its indictment of the current regime might lead one to think that Timermans was a member of a left-wing party not unlike Podemos. But Timermans could not be further from endorsing left-wing politics: a professor of the history of financial institutions at the King Juan Carlos University, he is an opinion columnist for the conservative online daily Libertad Digital. Timermans’ statement is as much a clichéd and supposedly counterintuitive turning of the tables on conventional wisdom as it is a diagnosis of the Right’s failures meant to recriminate its decadent habits and rejuvenate its defence of the political order. Echoing one of Robin’s most powerful arguments in The reactionary Mind, for conservatives looking to revitalize their cause such as Edmund Burke or Joseph de Maistre, ‘the greatest enemy of the old regime is neither the revolutionary nor the reformer; it is the old regime itself or, to be more precise, the defenders of the old regime.’ Why? Because ‘they simply lack the ideological wherewithal to press the cause of the old regime with the requisite vigor, clarity, and purpose.’  This insight – that the Right often criticizes itself more poignantly and more harshly than it criticizes the Left – is nowhere more visible in Spain today than in the reaction, sensu stricto, to Podemos. After the elections for the European Parliament on 25 May 2014, conservatives predictably appeared in droves, denouncing the party on television talk shows, on radio morning shows and in newspaper op-eds. More stunning, however, than this immediate deluge was the fact that the first book on Podemos was published exactly one month after its electoral victory, on 25 June 2014. Edited by John Müller, a long-time journalist for El Mundo, #podemos: Deconstructing pablo Iglesias is a volume of essays nearly universally critical of the party and titled without the slightest hint of irony. Frenzied in its assemblage, the book is best described, as Müller himself says, as an ‘instant book’. Though Müller refers to the hasty way in which the book was written, edited and published, one might instead understand ‘instant’ to mean the snapshot of Spanish conservatism following one of the most surprising electoral achievements by a party not named the Popular Party or the Socialist Party in the past decade, if not since the country’s transition to democracy in the late 1970s. The line-up of contributors to this first book on the party was narrow by design as much as necessity. A significant number of the writers included were associated with El Mundo and nearly all of the contributors claimed to work as either journalists or economists, or both. The idea that Podemos is a ‘construction’, built from outside Spanish politics, is not unique to conservatives. It strikingly resembles, in fact, one of the most widespread criticisms of the party from the centreLeft. Just as Quirós understands Podemos to be instrumentalizing politics for other means, many Socialists have similarly criticized the party for being populist, which they understand to be a perversion of democracy for anti-democratic ends. Santos Juliá, the historian of reference for El país, Spain’s newspaper of record, often closely politically aligned with the PSOE, compared a speech by Pablo Iglesias to the rise of Nazism during the Weimar period, by way of Cabaret. Here is Juliá: ‘“Tomorrow is ours”, Iglesias concluded in his first fiery speech at the European Parliament. And it is impossible, upon listening to him, not to remember that handsome young German man, with his foot on a table, overcome with emotion, singing “Tomorrow belongs to me”.’  Just as the Nazi Party, with the help of Carl Schmitt (whom Iglesias and Monedero are fond of citing), illegitimately upended the Weimar Constitution upon reaching power, Podemos, according to Juliá’s metaphor, will turn Spain towards authoritarianism as soon as it has the ability to do so. For Socialists such as Juliá, the lesson Spaniards must learn is to be wary of any internal threat that might use politics to steer the country away from liberal democracy. In a similar move, the PSOE leader Pedro Sánchez warned on national radio that Podemos is a populist party that seeks to deliver Spain down the path of Chávez’s Venezuela, which, for him, meant ‘rationing lists, a lack of democracy, and greater inequality and poverty’. Sánchez, like so many others both on the Right and on the Left, described the party as populist, which, on his account, is something that comes from outside of liberal democracy. Once it takes hold, the argument suggests, it steers politics away from liberal democracy and towards authoritarianism, bringing all the associative ills with it. Another contributor to the volume, Esteban Hernández, explains that ‘the role Podemos play in Spain is that they exist as outsiders who are entering the political field not with the intent of occupying a space, but of transforming the rules of the game.’  As Cas Mudde summarizes it, in reference to Podemos and Syriza, ‘In short, populism is an illiberal democratic response to undemocratic liberalism.’  In addition to taking issue with its illiberalism, readers are supposed to grasp from this statement populism’s outsider character. The definitional fusion of liberalism and democracy, synonymous with the kind of regime the Left should support instinctually, thereby rejects populism as something inherent to the political sphere. It condemns populists for not seeking correctives to ‘undemocratic liberalism’ from within this sphere. But in doing so, it solidifies the place of liberalism within political discourse, making it immune to a critique ‘from within’ it would consider legitimate. Socialists such as Sánchez and Juliá would reject any description of their narrow definition of democracy – synonymous with liberalism – as a construction. Yet, their populist understanding of Podemos looks indistinguishable from the constructivist conservative one: they share the same concerns about the party’s threat to liberalism, especially when it comes to defending free markets as the quintessential expression of liberty. Populism is the one category over which Populars and Socialists agree when defining the character of Podemos’s politics. Elsewhere in #podemos, the volume’s editor, John Müller, goes to some definitional length to understanding the nature of the party’s supposed populism. Beginning with the required one, an appeal to ‘the people’ against an ‘elite’, Müller’s definition quickly moves to the realm of economics since ‘there is no consensus over a scientific definition’ of populism. The carte blanche Müller gives himself in defining the term leads him to see populism as ‘synonymous with irresponsible macroeconomic measures, economic nationalism, state intervention, and redistributive or clientilist policies’. He then proceeds to cite a series of articles and books that focus exclusively on its expression in Latin America, often focusing on figures such as Hugo Chávez in Venezuela and the Kirchners in Argentina. What groups these disparate political formations together, for Müller, is not a shared ideological commitment or Mudde’s notion of a democratic response to an undemocratic regime, but rather an idea that only works in hindsight: populist regimes are those that have implemented popular policies, but have ultimately hurt the economic interests of the majority. In Müller’s hands, this incoherent and self-serving definition of populism – populism is ‘bad’ macroeconomic policy – cannot even live up to its own standards. Müller notes that Argentine populism includes the state interventionism of Juan Domingo Perón, the economic nationalism of the Kirchners and the neoliberalism of Carlos Menem. How such a definition is able to give conservatives any insight into populism remains far from clear. The ultimate goal of such writing, however, is less to speak about Podemos than to diagnose conservative mid-term malaise in Spain. ‘In the Spanish case,’ writes Müller, following Quirós’s criticisms in For a Liberal right-Wing, ‘this rhetoric has found support in reality thanks to the disappearance of meritocratic selection principles in politics, the corruption cases that touch nearly the entire political spectrum, and other institutional anomalies, like the distribution of posts in the judiciary among the two large parties, the so-called “revolving doors” between the political and corporate worlds, or the delay of the judiciary at the time of resolving corruption cases.’  Podemos, for many on the Right, may be a populist attempt to steer the government towards authoritarianism; but if it is, Müller argues, the Right has a lot to do with its rise to power. It is precisely the Right’s economic, political and social failure, on his account, that has nourished the tremendous growth of new parties such as Podemos. I suspect that most on the Right, and nearly all of the contributors to #podemos, would agree with these self-criticisms. Juan Ramón Rallo certainly does. A young and upcoming economist who self-describes as an adherent to the Austrian school of economics, Rallo writes that Podemos is right to ‘forcefully denounce the real problems’, which include ‘the worrying pauperization’ of many, ‘the uneasy entente between politicians and important businessmen, [and] the deteriorating quality of public services’. Both Rallo and Müller are careful to make clear that Podemos’s rhetoric is not based on fiction or misrepresentation, but rather on wrongheaded economic policies. Though insensitive when it comes to understanding populism, conservatives such as Rallo and Müller prove to be extremely sensitive to conservatism’s contribution to creating the circumstances for their own defeat. Movements like Podemos, they note, are as much a construction of the Right as of the Left – but their root causes, from unemployment to evictions, are always material in nature. The notion of construction also brings up the question of intentionality. If Podemos is a populist construction meant to transform liberal democracy into something else, who exactly is doing the constructing and why are they doing it? This is a fraught topic for conservatives, who on the one hand look to criticize what they see as political opportunism, but on the other wish for their words to be taken more seriously than outright slander. Quirós himself vacillates over whether the leaders of Podemos actually intend to destroy the Spanish economy, by which he means reject the austerity measures imposed by the International Monetary Fund, the World Bank and the European Central Bank, and instead institute something along the lines of a Universal Basic Income. ‘Although this may not be the intention of its leaders and of those who gave the party their support at the ballot box,’ he writes in his final paragraphlength salvo, ‘its economic policy would have, thus, an authoritarian slant. … This is indisputable and, besides, there’s no reason that it should bother [the party’s] defenders, one of whose leitmotifs is precisely to dismantle the liberal democratic capitalist system.’  To the fusion of liberalism and democracy, conservatives such as Quirós add capitalism. The already suspect intentionality claim that Podemos wants to become authoritarian gets dissolved in the haste of declaring such claims indisputable. These outbursts of thoughtlessness, to be sure, are the Right’s lowest, most uninteresting, points. But Quirós is at his best when telling a narrative of loss. Robin notes in his book the imaginative power and persuasive force conservatives often wield with this narrative of loss. ‘People on the left often fail to realize this, but conservatism really does speak to and for people who have lost something’, he writes. ‘The loss may be as material as money or as ethereal as a sense of standing. … Even so, it is a loss, and nothing is ever so cherished as that which we no longer possess.’  Quirós’s narrative of loss has to do with the ethereal, the possible: future loss. What would happen if Podemos were to control Spain? The question brings out the science fiction in him, narrated as a counterfactual story of what might happen were Podemos to ever reach power. He describes scenes eerily reminiscent of Weimar Germany, creeping toward 1933: ballooning inflation, economic misery and support for a populist leader who ‘appeals to and nourishes one of the lowest instincts of human beings: resentment’. But in this ‘journey towards the precipice’,  Quirós seems to most clearly be criticizing his conservative kin. Echoing the argument he will later make in For a Liberal right-Wing, he excoriates Podemos for clinging on to Old World values. Though we are supposed to read Podemos’s ‘conservatism’ as a reference to the economic policies it supposedly borrowed from Stalinism, it seems much more appropriate to read in these lines Quirós’s own dissatisfaction with conservatism in Spain, which still clings to the centralization of economic power in the state. For Quirós, adapting to the realities of the twenty-first century means decentralizing economic power from the state and instead privatizing existing public services such as transportation, health care and education. Like Timermans, Quirós inveighs against conservatives, at least implicitly, for taking such a superficial view of a party as to miss its direct challenge to neoliberal economics. Such a challenge to a conservative position should be felt sharply by those on the Right. Quirós makes clear, however, that this hasn’t yet been the case. This is because many conservatives, too, partake in the economic centralization of yesteryear. In sum, Castañeda places figures like Lula in Brazil and Bachelet in Chile on the side of the ‘first’ Left, and Chávez in Venezuela, Morales in Bolivia and Kirchner in Argentina on the side of the ‘second’ Left. The goal of Müller’s distinction, like Castañeda’s, is less to provide an adequate history of left-wing politics than it is to mark Podemos’s outsider status: in this case, to be an outsider means to be economically anachronistic, to have ulterior political motives, and to import into Spanish politics something that is not Spanish – all of which symbolize extreme irrationality. Beyond referencing Venezuela as a shorthand for authoritarianism, these conservative critics of Podemos in Spain generally have unsophisticated accounts of Latin American politics. But their attempts to provoke instinctual negative responses by invoking their former colonies frequently serve as moments to reflect on burgeoning left-wing movements in Spain such as the anti-eviction movement and, especially, the indignados movement of 2011. Esteban Hernández’s essay in the volume is a case in point. A writer for the conservative online daily El Confidencial, Hernández structures the account he gives of the indignados movement and its subsequent transformation into Podemos in a nationalistic way. For Hernández, the indignados movement was remarkable in the way it brought together ‘leftist groups, disillusioned people, angry citizens, and a peculiar sense that everything could change, starting with the ways of doing politics’. That new way of doing politics would be participatory and horizontal. Years later, the birth of Podemos would reignite this horizontal way of doing politics, but it would do so, Hernández argues, in conflict with the populist ideas harboured by many of its leaders, including Pablo Iglesias, Íñigo Errejón and, especially, Juan Carlos Monedero. ‘Monedero had some ideas, extracted from the Latin American experiences he had known,’ writes Hernández, ‘and they were possibly applicable in Spain, but they did not harmonize well with that new logic that excluded the strong leadership and rigid structures of the past.’  Podemos, Hernández argues, is the name of their attempt to harmonize this quintessentially Latin American way of doing politics with the new Spanish way of ‘horizontal processes’ and ‘collective organizations’,  associated with the indignados. Hernández pits these two apparent divisions within Podemos against each other: Latin America’s old world politics against Spain’s new youth-inspired methodology. It would be easy to point out that Hernández’s characterization is simply not true. But more revealing is the vocabulary of Hernández’s argument, where terms such as ‘extraction’, ‘application’, ‘harmonization’ alert readers to the outsider challenge Podemos poses to the organic narrative about Spanish politics. The final critical prong that appears in the essays in #podemos concerns the media presence of some Podemos members. Conservatives remark on the very visibility of these members – especially their ability to access Spain’s national television channels like La Sexta or Cuatro. It too is often treated as an intervention from the outside. Or they also appear as youthful frikis, (‘weirdos’) as Pedro Arriola, Prime Minister Mariano Rajoy’s adviser, said shortly after the election, disrupting the polite company of Spain’s political and economic elites. In his contribution to the volume, Fran Carrillo, the CEO of a company that trains business and political elites in communication skills, rewrites the narrative of the party’s emergence not according to the political biographies, but rather to the media histories of its major figures. This subtle reframing of the conservative assessment of the party empties Podemos of political ideology, reducing it to a question of media time and strategy and, in the process, repackaging the formalistic critique as a strategy for reinvigorating the Right. What the Right in Spain must do to counter Podemos, Carrillo suggests, has less to do with questioning the soundness of its underlying ideological commitments than it does with clothing them in the new vocabulary of indignation. Such a self-assessment by the Spanish Right may come as a surprise to some, especially in the USA where the Right is deft at dressing up its policies or principles in sheep’s clothing (think of the distinction between pro-life and pro-choice, for example). But in Spain, the Right has long relied on conservative talking points that date back to the Franco era without having refurbished them. Carrillo argues that Podemos used a ‘boomerang’ political strategy never before seen in Spanish politics. This strategy consists, according to Carrillo, of getting close to the streets, listening to what messages they launched, and what protest and petitioning words citizens were using, in order to, later, and once sifted and wrapped with adequate formality, return these messages to the street, transformed into pure nitroglycerine: incendiary, revolutionary, and indignant discourses. The publication of #podemos in the summer of 2014 launched a cottage industry of conservative books critical of the new leftist party. It would take, however, until the autumn for it to pass the baton to a successor. The first and most substantive of these was Asís Timermans’ podemos? Perhaps owing to its rushed publication, what immediately stands out about the book is its overwhelming amount of direct and block quotations. Timermans’ book in many ways resembles certain eighteenthand nineteenthcentury works of historical scholarship, whose pages reveal the author’s desire to include as much direct quotation as possible. Books were expensive at the time and citation practices prized full-length quotations as much for their ability to centralize information into one volume as a means for displaying the honesty of the scholar – readers could evaluate the scholarship by referring to the entire quotations in full instead of relying on scholarly summaries that might otherwise miss important aspects of the passages they cite. The practice has changed, however, and Timermans’ book seems woefully out of touch with publication standards in Spain and elsewhere because of it. Timermans’ goal in podemos? is to answer the question of why so many apparently ideologically uncommitted voters in Spain decided to vote for Podemos on the day of the European elections. In other words, what was the nature of this ‘protest vote’, as it is often called? And why did so much of it come from the ranks of traditional parties like the PSOE and PP? People who otherwise would simply have voted for the other major party, in protest to the previous administration, instead decided to vote for a different party altogether, which in the weeks leading up to the elections was expected by most polls to perhaps achieve one representative at best. Timermans is especially concerned with this question from an ideological perspective. Had these voters been motivated by ideology, they would have cast their protest vote in favour of similarly minded parties such as the centre-right Ciudadanos party or the farright Vox party. But they were not. They were instead motivated by questions of honesty and responsibility, which they saw manifested in Podemos’s focus on corruption and democracy. The PP’s failure to identify this worry among the population, Timermans claims, has to do with ‘Arriolism,’ a strategy from Pedro Arriola (the same advisor that called Podemos voters ‘weirdos’) that prioritizes hacer números (‘racking up numbers’) over building an ideological project. The idea behind this strategy of ‘counting votes’ has to do with surpassing the minimum threshold of votes in order to remain in power. When translated into strategy, Timermans writes, the idea of ‘counting votes’ resorts to a fearmongering rhetoric meant to scare voters just enough into voting for the PP and maintaining the status quo. To be sure, much of Timermans’ book resorts to the very language of fearmongering he claims is counterproductive for the Right. At one moment, for example, Timermans discusses Podemos’s círculos, the party’s political organs for revitalizing democracy and instituting a more horizontalist approach to policy decision-making. 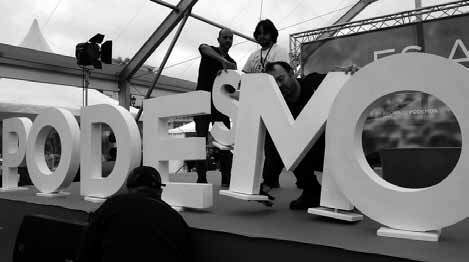 A Podemos circle is an assembly-like formation that emerged from the indignados movement during the summer of 2011. Divided into sectorial and thematic types, Podemos circles are open to anyone and their agendas revolve around debate, developing policy and proposing solutions to issues deemed important by its members. Podemos’s regional and national leadership are then obliged to publicly advocate and propose the policies that result from these processes. As one can imagine, the process is fraught with many of the procedural issues associated with radical democratic politics: few decisions on proposals are ever reached, proposals are sometimes vague because they seek to include a cacophony of different and often contradictory opinions, and the party’s national leadership has to discriminate in favour of those they see as the most politically viable. Timermans, in his discussion of Podemos circles, points to the existence of a Muslim Circle in the party as something that should worry both Podemos partisans and non-partisans alike. ‘The mere existence of a circle characterized by the religion of its members is significant and unsettling’, he writes. The circle in question, in reality, is not itself religious. None of the members bases their membership on their Muslim beliefs, if they even hold any; their membership is instead political, meaning that they believe Spain’s social and economic policies affect Muslims in a particular way that deserves critical albeit minimal scrutiny. ‘And yet’, Timermans claims, ‘the fact that a secular party like that of Iglesias contemplated the existence of circles shaped in view of the religion of its members is polemical.’  Timermans’ assumption that Muslims necessarily populate Podemos’s Muslim Circle reveals his failure to grasp the purpose of Podemos circles oriented around themes, which include everything from fine arts to feminism. Podemos, as one might assume, also has a Jewish Circle, a Catholic Circle and a Progressive Spiritual Circle, yet curiously Timermans does not think to mention these other religious groups associated with the party. What the passage manifests likely has more to do with the Right’s latent xenophobia against Arabs than with any concern over the functioning of the Muslim Circle itself. For all its gaps in argument, Timermans book nevertheless offers perhaps the clearest confirmation of Corey Robin’s important claim that right-wing thinkers often reserve their most scathing criticism for other right-wingers, whom they perceive to be complacent in the face of an existential threat from the Left. He explains early on in the book that, in the fallout of the elections for the European Parliament, the Right debated whether to ignore or use the emergence of Podemos to spark fear in its constituents. The belief was that this would convince those who had decided to support Podemos to flock back to the PP. But ‘fear facing hope, apart from being erroneous, turns out to be useless’, Timermans underscores. For Timermans, that the Right resorted to fearmongering in the wake of the elections illustrated its failure to take Podemos seriously. Such failure to take Podemos seriously on the Right even persisted well after the publication of Timermans’ book, when Spain’s national public television station, Televisión Española (TVE), which is currently run by the PP, admitted to effectively censuring Iglesias and other Podemos members from appearing on its station, the most watched in the country. ‘Instead of asking themselves how things could be so bad that a minor group of political scientists on the radical Left were able to design a party and convert it into the protagonist of political life’, declaims Timermans, ‘some prominent members of the PSOE wanted to precipitously grow a pony tail and others on the Right called them “weirdos”. If they didn’t understand that the votes and sympathies toward Podemos were coming and come from normal people, they don’t understand anything.’  Informing its ignorance, the Right, Timermans notes, has largely thought of Podemos as something that only electorally affects the Left and may, in fact, even bring about a division within the Left that would benefit the PP. But, for him, that the Right is not willing to overhaul its failed politics of racking up numbers for a new ideological project exhibits the extent of its deterioration. ‘To the extent that the Rajoy-led and Arriola-advised Popular Party refused to promote an ideological project, to oppose to Spain’s crisis an idea of the Nation, to offer an economic and social model to resolve unemployment and the difficulties of a significant part of the population’, writes Timermans, ‘the Popular Party was only left with a strategy of fear. The fear of Podemos.’  Basking in the success of Rajoy’s absolute majority victory in the 2011 national elections, the PP has certainly rested on its laurels, and the authors mentioned above are not the only conservatives to express disappointment with the Right’s lack of vision. Yet, until recently, the PP has not had to endure from the Right the amount or kinds of ideological challenges that the PSOE has suffered on the Left. Unlike in the United States or elsewhere in Europe, those who have most vocally called for the PP to articulate anew an ideological vision of Spanish conservatism haven’t been especially xenophobic, associated with fascism or called for violence. The PP, further to the right than the Conservatives in Britain or the Christian Democrats in Germany, has maintained a disciplined public face despite the direct ties of its leaders and supporters to the Franco regime. Part of this has to do with its decision to become a mainstream party in a liberal democracy, thereby incorporating more moderate sectors of the Right. Another part also has to do with structurally accepted forms of racism that persist in Spanish society, toward North Africans, Gypsies and other marginalized ethnic minorities. Similar to their fellow members of the European People’s Party, they have instead been the more peaceful but equally objectionable proponents of accelerating the implementation of neoliberal economics, a policy that would completely eliminate social services and make citizens further beholden to the whims of capitalist exploitation. In mid-nineteenth-century Spain, the figure of vitality on the Right was Donoso Cortés, who, in reaction to the revolutions of 1848, developed a theory of dictatorship that resonated with many Continental conservatives. Today in Spain, that figure more closely resembles a centrist-looking critic such as Timermans, Müller, Quirós or Rallo – ‘centristlooking’ because, unlike the far Right, they hold what they see as a non-ideological commitment to the sovereignty of neoliberal markets. This ‘centrism’ is anything but. And if the harmonious reaction of these ‘centrists’ to the appearance of Podemos – a party whose chief aim is to undo market sovereignty – is any indication, we can safely assume that the Right is indeed revitalizing its ideological vision as we speak. I would like to thank especial y Sebastiaan Faber and José Luis Vil acañas Berlanga for their comments on a draft of this article. 2. ^ Pablo Iglesias, ‘Understanding Podemos’, New Left Review 93, May–June 2015, p. 14. 4. ^ Raphael Minder, ‘Thousands March in Spain to Support Left-Wing Party’, New York Times, 31 January 2015. 5. ^ Iglesias, ‘Understanding Podemos’, p. 13. 6. Íñigo Errejón Galván, La lucha por la hegemonía durante el primero gobierno del MAS en Bolivia (2006–2009): Un análisis discursivo, doctoral dissertation, Complutense University of Madrid, 2012. It is available at eprints.ucm.es/14574/1/T33089.pdf. 8. ^ Iglesias, ‘Understanding Podemos’, pp. 14–16. 10. ^ Íñigo Errejón, ‘Ernesto Laclau, Theorist of Hegemony’, trans. Clement Petitjean, VersoBooks.com, 30 April 2014, www.versobooks.com/blogs/1578 [archive]–ernesto-laclau-theoristof-hegemony. This obituary original y appeared in the Spanish digital newspaper Público. 12. ^ Anna Marie Smith, Laclau and Mouffe: The Radical Democratic Imaginary, Routledge, London, 1998, p. 32. Barcelona, 2014, p. 223; emphasis in original. All translations from Spanish are mine, unless otherwise noted. 15. ^ Ibid. ; emphasis in original. 16. ^ Errejón, ‘Ernesto Laclau’. 17. ^ Errejón, ‘¿Qué es Podemos’, p. 223. 18. ^ V.I. Lenin, What Is to Be Done? Burning Questions of Our Movement, International Publishers, New York, 1969, p. 157; emphasis in original. 19. ^ Ibid., p. 158. 20. Iglesias, ‘Understanding Podemos’, p. 14. 21. ^ Ibid., p. 16. Madrid, 2008; Mario Martín Gijón, Los (anti)intelectuales de la derecha en España. De Giménez Cabal ero a Jiménez Losantos, RBA, Barcelona, 2011; Manuel Vázquez Montalbán, La aznaridad. Por el imperio hacia Dios o por Dios hacia el imperio, Mondadori, Barcelona, 2003; Luisa Elena Delgado, La nación singular. Fantasías de la normalidad democrática española (1996–2011), Siglo XXI, Madrid, 2014. 23. ^ Throughout this article, I tend to use the terms ‘Right’, ‘liberal’, ‘conservative’ and ‘neoliberal’ somewhat interchangeably to describe this strange right-wing political reality in Spain. But, while these often overlap, each term enjoys some specificity. The terms ‘Right’ and ‘conservatism’ mostly describe the entire side of the spectrum to the right of the Partido Socialista Obrero Español (PSOE), from Unión, Progreso y Democracia (UPyD) and Ciudadanos (Cs) to the Partido Popular (PP) and the present-day offshoots of the Falange. The terms ‘liberal’ and ‘neoliberal’, by contrast, point to the various shades of economic liberalism within the Spanish Right. Proponents of this economical y oriented kind of conservatism often criticize their fellow travel ers for failing to abandon cultural conservatism, not only because it is directly tied to Franco-era Spain, but also because it holds on to ideas about a centralized state and planned economy. 24. ^ Corey Robin, The Reactionary Mind: Conservatism from Edmund Burke to Sarah Palin, Oxford University Press, Oxford and New York, 2011, p. 35. 26. ^ Asís Timermans, ¿Podemos?, Última Línea, Madrid, 2014. 27. ^ See the bibliography on Podemos at the end of the article. 28. ^ Robin, The Reactionary Mind, pp. 247–8. 29. ^ For a discussion of the anti-Venezuelan tendency in the Spanish media, see Marianela Urdaneta García, ‘La imagen de Venezuela en la prensa española. Una visión desde los diarios: El País, El Mundo, ABC y La Vanguardia’, Revista Mediterránea de Comunicación, vol. 2, no. 1, 2011, pp. 15–42. 30. ^ Timermans, ¿Podemos?, p. 19. 31. Timermans, ¿Podemos?, p. 20. 32. ^ Robin, The Reactionary Mind, pp. 44–5. 33. ^ Miriam Muro, ‘Entrevista a John Mül er’, Libertad Digital, 28 July 2014, www.libertaddigital.com/espana/2014 [archive]–06–28/john-mul er-si-podemos-l ega-a-gobernar-espana-estaacabada-1276522451. 34. ^ Lorenzo Bernaldo de Quirós, Por una derecha liberal, Deusto, Barcelona, 2015. 35. ^ Eduardo Guerrero, Ana María Velasco and Gabriela Maldonado, eds, Voces para un diálogo de futuro: El debate sobre Desarrol o Sostenible en América Latina, UICN, Quito, 2003, p. 51. 36. ^ Lorenzo Bernaldo de Quirós, ‘El programa económico de Podemos: ¿Es viable’, in John Mül er, ed., #Podemos: Deconstruyendo a Pablo Iglesias, Deusto, Barcelona, 2014, pp. 123–4; my emphasis. 37. ^ Quirós, ‘El programa económico’, p. 124. 38. ^ Santos Juliá, ‘Gente será, mas gente empoderada’, El País, 8 August 2014, cultura.elpais.com/cultura/2014/07/24/ babelia/1406215148_985080.html. 40. ^ Esteban Hernández, ‘¿Por qué una campaña tan vieja como la de Podemos funcionó?’, in Mül er, ed., #Podemos, pp. 108–9; emphasis in original. 42. ^ John Mül er, ‘¿Y ahora, qué? El Nuevo mapa político español tras la irrupción de Podemos,’ in Mül er, ed., #Podemos, p. 188. Georgy Egorov and Konstantin Sonin, ‘A Political Theory of Populism’, Quarterly Journal of Economics, vol. 128, no. 2, 2013, p. 772. 46. ^ Mül er, ‘¿Y ahora, qué?’, p. 191. 47. Juan Ramón Ral o, ‘La respuesta a la indignación ciudadana: ¿más o menos Estado?’, in Mül er, ed., #Podemos, p. 140. 48. ^ Quirós, ‘El programa económico’, p. 137. 49. Robin, The Reactionary Mind, p. 58. 50. Quirós, ‘El programa económico’, p. 124. 51. ^ Ibid., p. 136. 52. Ibid., p. 125. 53. Mül er, ‘¿Y ahora, qué?’, p. 187. 54. Jorge Castañeda, ‘Latin America’s Left Turn’, Foreign Affairs, vol. 85, no. 3, 2006, p. 29. For a study that situates Castañeda within a broader context of contemporary Mexican intellectuals who defend neoliberalism, see Ignacio M. Sánchez-Prado, ‘The Democratic Dogma: Hector Aguilar Carmín, Jorge G. Castañeda, and Enrique Krauze in the Neoliberal Crucible’, in Debra A. Castil o and Stuart A. Day, eds, Mexican Public Intellectuals, Palgrave Macmil an, New York, 2014, pp. 15–44. 55. ^ Hernández, ‘¿Por qué?’, p. 94. 56. Ibid., p. 97. 57. Ibid. 58. ^ George Ciccariel o-Maher, for example, has chronicled the horizontal, assembly-model political organizations upon which civil society in Venezuela is currently built. George Ciccariello-Maher, We Created Chávez: A People’s History of the Bolivarian Revolution, Duke University Press, Durham NC, 2013. 60. ^ Fran Carril o, ‘La estrategia de comunicación, ¿clave del éxito de Podemos?’, in Mül er, ed., #Podemos, p. 75. 64. ^ Timermans, ¿Podemos?, p. 166. 65. Ibid. 66. ^ For the party’s Jewish Circle, see www.facebook.com/podemosjudios [archive]; for its Catholic Circle, see www.facebook.com/pages/Podemos-CristianosCat [archive]%C3%B3licos/288375928023932; and for its Progressive Spiritual Circle, by far its most active and numerous, see podemosespiritualidadprogresista.wordpress.com. 69. ^ Timermans, ¿Podemos?, p. 21. 70. Ibid., p. 25. John Mül er, ed., #Podemos: Deconstruyendo a Pablo Iglesias Deusto, Barcelona, June 2014. Asís Timermans, ¿Podemos?, Última Línea, Madrid, October 2014. Enrique Riobóo, La cara oculta de Pablo Iglesias. De Canal 33 a Bruselas, Madrid: Vivelibro, October 2014. Ana Domínguez and Luis Giménez, Claro que Podemos. De La Tuerka a la esperanza del cambio en España, Los libros del lince, Barcelona, November 2014. Matteo Pucciarel i and Giacomo Russo Spena, Podemos. La sinistra spagnola oltre la sinistra, Alegre, Rome, November 2014. Palma de Mal orca, January 2015. José Ignacio Torreblanca, Asaltar los cielos. Podemos o la política después de la crisis, Debate, Barcelona, April 2015. Estela Mateo Rigueiro, ed., Hasta luego, Pablo. Once ensayos críticos sobre Podemos, Catarata, Madrid, April 2015.